December 14, 2012 - In an act of perceived ‘self-liberation’, Adam Lanza opens fire amongst defenseless elementary students. 28 dead, 2 injured. February 14, 2018 – Nikolas Cruz, self-proclaimed ‘professional school shooter’ opens fire with an AR-15 semi-automatic. 17 dead, 14 injured. In the wake of these and many other devastating school shootings in the United States, there seems to be an ever present fear of when the next attack will occur. As tragic as these events are, American society seems to now take the approach that going to school is equivalent to going to war. The fact that there is such an element of uncertainty when it comes to preventing these attacks, has given too much leeway in terms of possible solutions. I by no means, mean to lessen the devastation that these events have produced – I do, however, intend to shine a light on the topics of conversation that have transpired as a result. Having been raised in Texas, I frequently heard the phrase, ‘go big or go home’ – it is precisely this kind of mentality that the President seems to be adopting. In a speech addressing a “post-Parkland” nation as well as at the National Rifle Association (NRA) convention, Trump delivered a call to arms … for teachers. 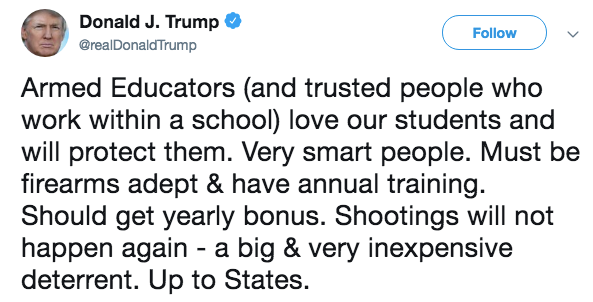 He believes that providing teachers with guns will serve as a deterrent to any future school shooter. Alongside Trump’s gung-ho approach, we see the media continuing to fuel the flames of gun violence. 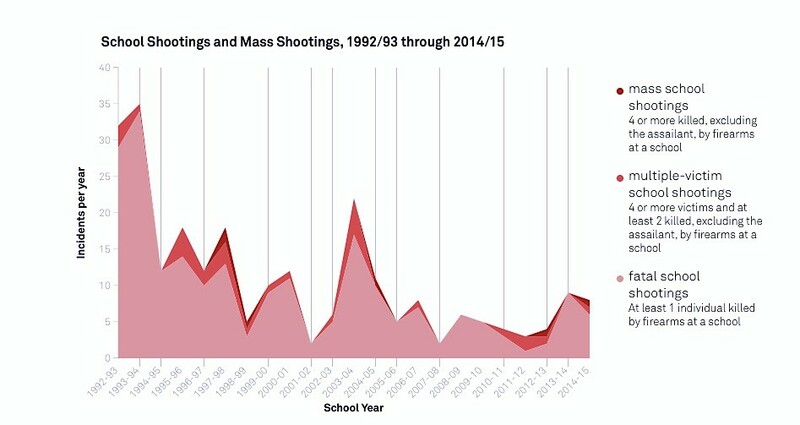 There are constant stories about school shootings that have skewed the public’s perspective of how often these incidents are actually occurring. These serve as an example of the ideas that Altheide discusses, regarding the ‘politics of fear’ and the constant need to take extraordinary measures (Altheide, 2006). How then, does it become possible to create a solution to both these perceived threats and existing threats? How do you predict these ‘known unknowns’ (Goldsmith, 2008)? How do you solve a problem when you don’t know who is going to commit the crime, where it’s going to happen, and when it’s going to happen? The looming threat creates a “risk society” in which there is a preoccupation with the future and risk becomes an increasingly generalized notion (Giddens, 1999). Due to the high levels of uncertainty, the public is vulnerable to the way in which this issue is framed. The concept of the ‘precautionary principle’ comes into play with Trump’s attempt to create preventative measures against these shootings. It seems to be very convenient that these solutions play right into the Republican’s agenda on gun control. Goldsmith explicitly states that this principle is important for what it reveals about how policies come about. I realize that there might be some rare instances in which this ‘solution’ could actually work, where the hero teacher saves the school from the crazed shooter – but let’s rejoin reality and recognize the greater risks associated with this decision. The most glaring would be a student’s ability to get their hands on a gun. Whether on purpose or by accident, the ability for a child to gain access to a weapon would increase significantly if they were to be carried at school. About 5,790 children in the US are treated for gun-related injuries every year – how drastically would that increase if they also had access to guns at school? Think about the psychological effects as well – studies have shown that just the presence of a gun increases levels of aggression. Doesn’t that defeat the intended purpose of arming teachers? Classrooms are supposed to be an environment that promote growth and learning, not the militarization of America’s youth. In addition, with the media’s attention on this subject, there begins to be a confusing line as to how much they could actually be influencing future attacks – these attacks could be misinterpreted by vulnerable individuals as an acceptable means of expressing their frustrations. Through these various pathways we see how a cycle begins to form and it is nearly impossible to point fingers at who is directly responsible – thus falling in line with Garland’s ideas of responsibility in cases of uncertainty (Garland, 1996). I believe that a better response to this ever-looming threat of school shooters would be to focus our attention on who these shooters are – what drives them to where they are today. From there, funds can be allocated to further mental health resources in schools as well as awareness programmes. Black market gun sales will always exist, but for those that are bought legally, we can at least limit who can buy one as well as ensuring that all private sales are registered. These are small steps, but they are at least a move in the right direction. This idea of arming teachers has become such a politicized topic - Republicans seem to be capitalizing on these school shootings to justify their own pro-gun agenda (favouring fighting fire with fire). On top of that, with each new election – depending on who’s elected– there is an inevitable unwinding of the policies put in place by the last government, creating an incredibly unstable environment and very limited long-term progress. The most alarming factor is the process by which this government (Trump) has been led by various groups and individuals to make these decisions. When it comes to the ideas of the precautionary principle, we see here that there are so many unknowns in this particular situation that it leaves an open floor for political parties to push their agenda. In this case, the NRA acts behind the curtain of the Republican Party to push theirs. They create the frame in which we see the problem of school shootings – thus playing into the politics of fear. At what point will we see a transition to less politicized ‘solutions’ and instead a real desire to solve the issue at hand?